Are you looking for Marrakech getaways for romantic and exotic vacations and breaks for couples ? Here are some hotels that offer a truly oasis with wide range of amenities such as swimming pool, high speed internet, hammam, in-room massage services, spa, sport and wellness programs, palm trees, lush gardens, traditional Moroccan architecture and more. Marrakech getaways and hotels for romantic and exotic vacations. With 12 rooms, individually styled with flair and imagination, a swimming pool and hammam, this place offers a truly personal experience, where guests can relax in an oasis of calm. Rooms come complete with his and hers’ bathrobes, safes, fridges and hairdryers. The roof terrace is the perfect place to unwind and enjoy the sun or evening drinks, affording total privacy and stunning views over the surrounding city and Atlas mountains. Some of the services are: Full Moroccan breakfast, Wi-fi internet access, Heated swimming pool, Private bathroom, Light lunch/BBQ menu throughout the day, Top quality cuisine in the evening, 24 hour room service, 24-hour front desk, Full catering available for parties or special events, Hammam and in-room massage service, Arranging car hire and more. 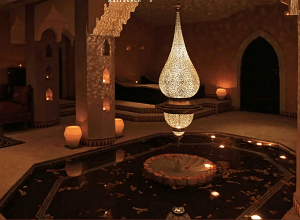 One of the most unique Marrakech getaways for memorable romantic vacations and holidays in Morocco. 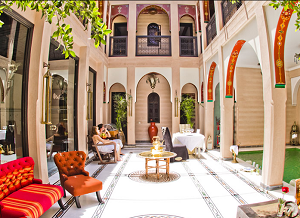 Ideally situated in the medina, the hotel includes rooms and suites, most with private terraces and fireplaces, 3 restaurants, a piano bar, a world-famous cooking school as well as a new spa including a traditional hammam, where natural products from the region of Marrakech are used. Guests at La Maison Arabe have a choice of swimming pools. One can relax at either the heated pool in the hotel’s garden patio, or at the pool located at our spectacular Country Club, 15 minutes away by complimentary shuttle. Definitely one of the best Marrakech getaways for exotic vacations and holidays for couples in Morocco, Africa. An oasis of wellbeing in the Palmeraie, a place of perfect tranquility between desert and majestic mountains, one of the best and most unique Marrakech getaways. The hotel’s new “Earth & Health” concept focusing on sport and wellness including the opening of the acclaimed Champion Spirit sports circle, an innovative spa menu and new 100% organic culinary specialties prepared by our Chefs. The principles of Feng Shui influenced the design, creating a harmonious balance between water, fire, wind, wood and metal for a truly soothing impression that helps all guests unwind. Rooms, suites, villas and palaces are set along meandering waterways throughout the resort. The resort’s program L’Experience Namaskar creates unforgettable memories, where guests discover exceptional places, learn about traditions, enjoy unique experiences and meet fascinating people. Conveniently close to the beating heart of Marrakech, Mosaic Palais Aziza & Spa, discreetly nestled away in the heart of the exclusive palm Grove “La Palmeraie”, it is an elegant and serene haven of luxury and one of the greatest Marrakech getaways for memorable vacations and holidays. This five star deluxe boutique hotel offers richly appointed guest rooms, suites, pavilions and garden villas tucked away in 5 acres of lush gardens planted with fruit and palm trees and lined with flower beds tastefully laid out around patios and pools. Some of the amenities are: 24 Hour reception, 24 hour security service, Babysitting service on request, Car rental, high speed wireless Internet access, Indoor parking, valet, In room safe, Room services, Wheel chair accessibility, Hammam and Spa, a wide choice of accommodation ranging from superior & deluxe rooms, junior suites, pavilions and Garden Villas, and more. This 16-hectare (40-acre) walled garden sanctuary is one of the best Marrakech getaways threaded with arcades and fountain courtyards, with low-rise accommodations nestled among olive and palm trees. 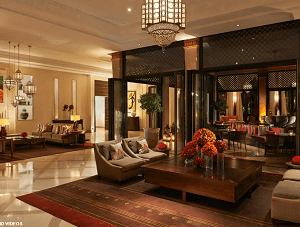 Each of the 141 Marrakech luxury hotel guest rooms – including 27 spacious suites – has a private balcony with contemplative views of the grounds, the historic Menara Gardens next door or the snow-capped Atlas Mountains. The hotel welcomes families with a special suite of amenities just for children and those travelling with them. No-smoking rooms are available, as are babysitting services. Le Spa at Four Seasons Resort Marrakech is a luxurious sanctuary of 17 spa treatment rooms inspired by Middle Eastern traditions and contemporary Western treatments. Some of the hotel amenities are: Family Pool, Quit pool, Fitness facilities, Tennis, Kids for All Season program, Young Adult Centre, Spa, Business Services, and much more. 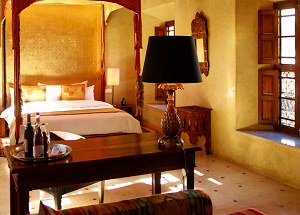 One of the unforgettable Marrakech getaways for romantic vacations. 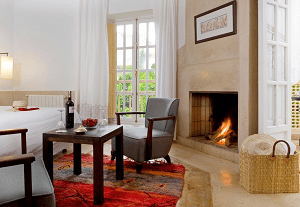 A charming hotel with property that has retained its original 19th century architecture while creating bedrooms and suites spread out among the jacarandas, the centuries-old olive trees, bitter-orange trees and other luxuriant plants in an exquisite garden of 3000m². 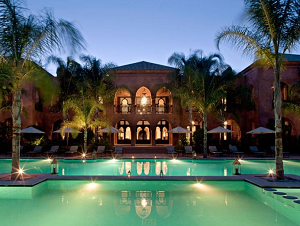 Les Jardins de la Medina is one of the best-placed boutique hotels for an outstanding stay in the Medina of Marrakesh. Only 10 minutes from the airport and from tour itineraries (the mountains or golf courses), its location enables you, above all, to discover the main tourist attractions in the city either on foot or by horse-drawn carriage. Some of the services and amenities are: Room service, Free Wi-Fi access, Supervised parking beneath the hotel, Travellers’ library, A complete range of treatments for face and body, hammam massage, large heated pool set in the midst of its luxuriant garden, 3 solariums, fitness room, and more. One of the greatest Marrakech getaways for vacations in Morocco. With 28 individually styled rooms and suites, tree-filled courtyards, a 7000ft2 roof terrace and a family of resident tortoises, El Fenn is one of the perfect Marrakech getaways from which to enjoy Africa’s most exotic city. Combining grandeur and historic architecture with hideaway nooks, terraces and gardens, the hotel is just five minutes walk from the world-famous Djemaa el Fna square and bustling maze of streets that make up the souk. Traditional beauty rituals are given a luxurious twist in the El Fenn spa. Relax by candlelight before being given a black soap scrub and a ghassoul clay body mask in our hammam – or hot room. You can order food anytime from morning until night, anywhere from the roof terrace and restaurant to your room. Or drop by the El Fenn bar for a cocktail by the pool. 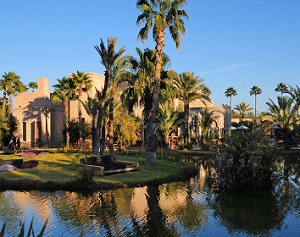 One of the greatest Marrakech getaways and hotels for exotic vacations and breaks for couples. See more Marrakech getaways and romantic hotels in Marrakesh for unforgettable exotic vacations in Morocco.